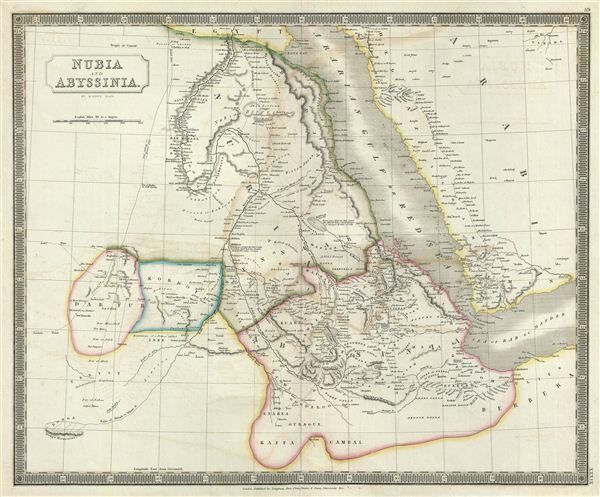 This is a beautiful map of Nubia and Abyssinia (Ethiopia) from Sidney Hall's extremely scarce 1835 New General Atlas. It covers from Darfur east through Kaffa (a Christian State) to the Sea of Bab el Mandeb (Gulf of Aden) and from the Desert of Chebba south through the 'Dominons of a Princes called Ibbe' to Donga. It includes the modern day countries of Sudan, Ethiopia, and Eretria as well as parts of Djibouti, Kenya, Egypt, Yemen and Saudi Arabia. Hall's map also includes details the politically and socially volatile regions of Darfur (Darfour) and Kordofan in modern day Sudan. This map is centered on the southern reaches of the Nile River. It shows the division of the Nile in modern day Sudan between the White Nile, which flows slightly westward toward Lake Victoria and the Blue Nile which flows slightly eastward to Lake Tana. The Blue Nile had, by this time, been traced to its source, Lake Tana (Tzana or Dembea), in the relatively well mapped Christian kingdom of Abyssinia. The White Nile is shown originating from the Donga Mountains in the extreme lower left quadrants of this map. It is a curious decision on the part of Hall to identify the Donga Mountains as a source of the White Nile, but abandon the associated lake theory that ultimately proved to have some relation to reality. The important caravan route of Sudan to Mecca is noted along with routes of several explorers in the region, including Browne 1796, Poncet 1698, and Bruce 1772, among others. During the time this map was prepared, Muhammad Ali, the Ottoman commander who was named viceroy of Egypt established the Mamluk dynasty that would rule Egypt until the Egyptian Revolution of 1952. Between 1820 and 1833, Ali annexed northern Sudan, Syria and parts of Arabia into the Mamluk Empire. Rumsey 4224.040 (1830 edition). Tooley, R.V., The mapping of Australia and Antarctica, 2nd ed., p. 92-93, no 687. Philips (Atlases) 758. National Library of Australia, 2113921; MAP F 514; MAP NK 10750/1; MAP RM 741; MAP T 687. Ristow, W., American Maps and Mapmakers: Commercial Cartography in the Nineteenth Century, p. 303-09.